The next Dragon Age is going to be a “live service” game, but what does that mean for a story-heavy RPG? This week on Kotaku Splitscreen, we discuss. Kirk and I crack open the mailbag this week to answer YOUR questions about how to get into Dungeons & Dragons, how video game companies can afford to delay their games so many times, whether we have rituals for finishing long games, whether Microsoft should release a living room PC, and much more. As always, you can reach us with your own questions and comments at splitscreen@kotaku.com. I really enjoy your podcast and your GDC coverage was great! My favorite games are the story driven RPGs (KOTOR, Dragon Age:Origins, Mass Effect, Witcher 3), but they seem to be dying in this era of multiplayer games as a service. My question: Is there a way to turn a game like Dragon Age: Origins into a live service game while keeping it single player and story driven? Jason: I think that question is something that BioWare is asking themselves constantly also—how do you turn Dragon Age into a live service game while also making it story focused? I think the obvious solution that people have come up with so far is just making it episodic and releasing different parts of the story as time goes on. I think there are a lot of interesting approaches you could take. One of the things you could do is make the story change based on what the players do, and there are some interesting experiments that I could imagine game developers taking. 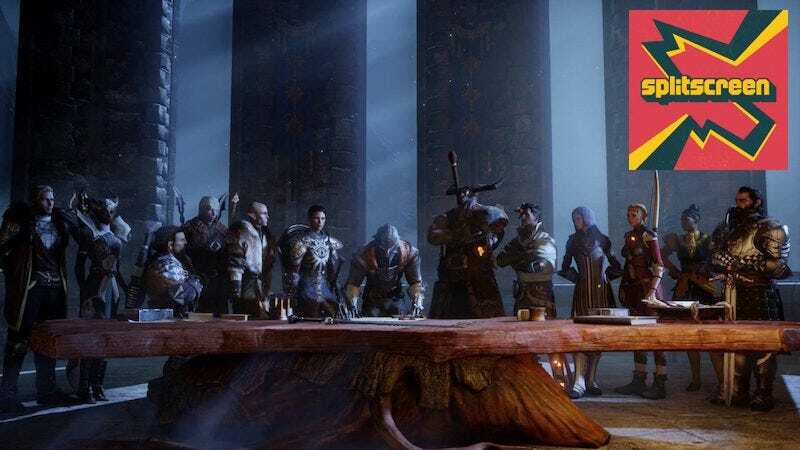 In a Dragon Age live service game, for example, if everyone had to side with either the templars or mages and whichever faction got the most players that became the canon decision and the story evolved from there. Then a pack came out next month that was like oh, the players decided to side with the templar, and then this and this happened. The other potential answer is that you go fully online and embrace a living world, MMO-style, and then I’m sure there are a billion other ideas I haven’t thought of. What do you think? Kirk: I think the “keeping it single-player” is the most challenging part of this, because the way multiplayer causes people to be more engaged, and more motivated to play, and get in there with their friends and do stuff, and that’s such a desirable thing for a game to have right now. At least for major publishers, I think just single-player alone is going to be uncommon, although there’s games like Divinity Original Sin 2 and stuff like that—there are still epic single-player RPGs, they’re just more double-A and less triple-A. Outside of RPGs, I think Hitman is a good example of a game that is a single-player complicated game that had a service component, timed events, chapters that were released the way you’re talking about. It was different than Life Is Strange or a Telltale game, or that wonderful-sounding thing you’re describing where the narrative changes. So yeah, people are still experimenting with these ideas, and I’m looking forward to whatever game it is that shows a new way forward. Maybe it’ll be Anthem, who knows? Jason: Yeah, although obviously that’s not single-player, it’s online-only. Kirk: Right, but they do seem to be saying it’s going to be a BioWare-style story, and a lot of writing, and it’ll feel like a single-player game. Jason: Yeah. I do think it’s really tough—how do you do a service game that’s story-driven and single-player? In January I reported that BioWare had rebooted Dragon Age 4 and is retooling it as a service game—and if you put the pieces together, look at how [creative director] Mike Laidlaw left, and Mark Darrah is now executive producer on Anthem, you can read the tea leaves here and see that Dragon Age 4 is getting totally overhauled. Not to say that it won’t be in the same universe, but the new game they were working on was overhauled. And I think they’re going to be exploring these questions and trying to figure out what they can do with Dragon Age as a service. Casey Hudson had chimed in after my article to be like, what we mean by live game is continued story support, basically saying what I had reported, but I think this is going to be different than just “game comes out, then there’s DLC.” I don’t think that’s the model they’re going for anymore. Especially because DLC, from what I’ve heard anecdotally, does not really sell that well anymore these days—those big $15 DLC packs don’t do that well anymore... I don’t think that model is super effective. I think they’re exploring new models, which’ll be interesting to see.